The A Team singer picked up best male video for Sing at the MTV VMAs, beating heavyweights Pharrell, Eminem and John Legend, as well as newcomer Sam Smith. Speaking on the red carpet at The Forum in Inglewood, California, before the ceremony, Ed said: "This is about as crazy as Americans get but in England our suit and tie events are raucous. This is quite tame to be honest because you're not allowed to drink during this. I mean we do, but you're not allowed to." 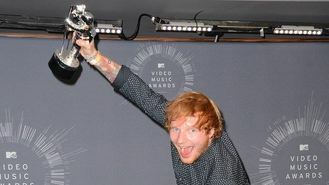 He picked up his gong and walked the red carpet with director Emil Nava, who has taken charge of all of Ed's videos and Emil joked: "Last year I had a bottle of water laced with tequila. No, it was water really!" Asked why the awards often seem to feature controversial performances, Ed said: "I enjoy the performances but when you are there you never realise it's a controversial moment but then you see the press the next day and realise it was." Also on the red carpet was rapper Snoop Dogg, who agreed controversy was not the aim of the game. "It's the place where everything is accepted, it's the place to be you can try out things, this is the place to be you. It's not about scandal; it's about having a great time and bringing life to the stage, something you believe in." However Jessie J, who opened the show with Nicki Minaj and Ariana Grande with their single Bang Bang said the VMAs are the place to go a little bit wild. "The boundaries are pushed, memories are made, vocals are alive. I'm honoured to be opening, it was amazing to work with these women, they are brilliant, so amazingl I think this is the perfect place to do our first performance together." The VMAs will air on MTV UK at 9pm on Monday.